set into the east wall of nave, on the outside, at Bedlington. 59.7 cm high (23.5''), 50.8 to 55.9 cm wide (20" to 22''), and built into the wall. Carved stone slab, set into the outside wall of the Church, dated to tenth century. There are two frontal figures carved on the slab, both cut off at the feet. Their shoulders touch and both have haloes with straight sides and wedge-shaped faces. The figure on the left is holding a staff, with what looks like a Tau top, in its right hand and a book in its draped left hand. The hems and folds of his drapery under the book are filled in by complex shallow pleats. 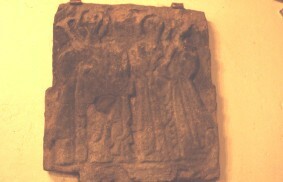 The figure on the right holds a rod in its left hand (the top of the rod has been broken off). Its right hand is held across the dress with the first two fingers extended in blessing. The edges of this figure's drapery are less elaborately pleated than on the other figure, but in the centre of the garment there is an intricate panel of V-shaped folds. Cramp, Rosemary J., County Durham and Northumberland. Corpus of Anglo-Saxon Stone Sculpture Series, Vol. 1 1st, Oxford University Press, Oxford (1984) Anglo-Saxon, Sculptures, Crosses..
Pevsner, N., The Buildings of England. Northumberland 1st, Penguin, Harmondsworth (1957) . Thompson, A.H., , ‘Bedlington church’. In Proceedings of the Society of Antiquaries of Newcastle (1922) 19, 251-66.